We would argue there’s so much to see and do in our fair emirate that you’d be hard-pressed to confine your visit to a single day. But we are slightly biased. It’s difficult, yes – but not impossible. With the news that the UAE Cabinet will soon be granting temporary entry visas to those transiting at Dubai International Airport, we’ve come up with the perfect one-day guide to the city. It ticks off all the big-name attractions, while leaving you with plenty to discover. Because once you’ve had a taste of what Dubai has to offer, we’re confident you’ll want to return. Welcome to Dubai, jetsetting reader. No doubt the sky is blue and the sun is shining because, well, it’s just another day in paradise. You’ll be wanting to get your bearings, and conditions are perfect for heading up to the top of the 150-metre-high Dubai Frame. This is one of the city’s newest attractions – it opened in January – and it offers uninterrupted views over both old and new Dubai. Helpfully, there are touchscreen displays which tell you exactly what you’re looking at, pointing out some of the city’s most important landmarks. There’s also a small museum inside, so you can learn about the city’s history, too. 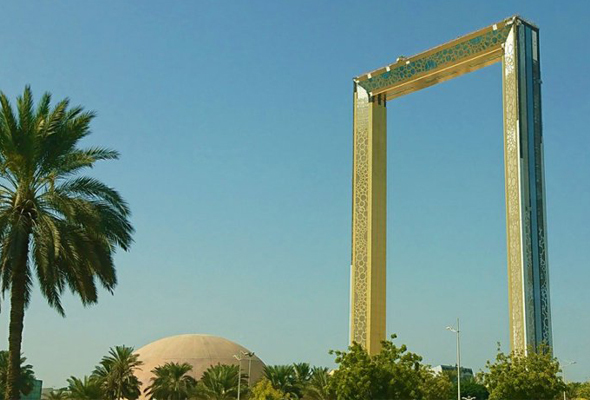 Dubai Frame, Gate 4, Zabeel Park, daily 9am to 9pm. Dhs50 adults, Dhs20 children. More info on Instagram. 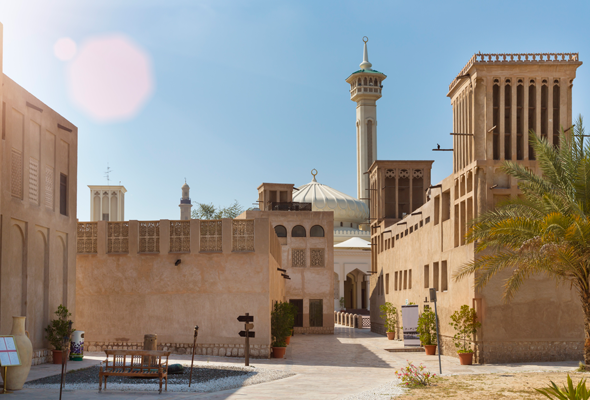 Jump in a taxi and travel back in time to one of the oldest areas of Dubai, the Al Fahidi Historical Neighbourhood (also known as Bastakiya). Stroll within its sand-coloured walls and pop into its quirky shops, museums and galleries. Here are some to look out for – the Dubai Coffee Museum, where you can sample a traditional Arabic coffee and some dates for about Dhs5, or head to the MAKE Art Cafe for a refreshing lemon mint juice and a peek at the artworks on display. It also has a great little gift shop where you can pick up prints, souvenirs and other knick-knacks made by local artists. By now you’re probably ready for an early lunch, and this is a lovely spot handily located within the Al Fahidi Historical Neighbourhood to sample some local fare. One thing to try is the shawarma – this popular dish consists of thinly-sliced meat, pickles, and fries stuffed into a soft pita, and all smooshed together to form a delicious sandwich. Finish it off with some camel milk ice cream, and congratulations, you’ve reached peak Dubai. 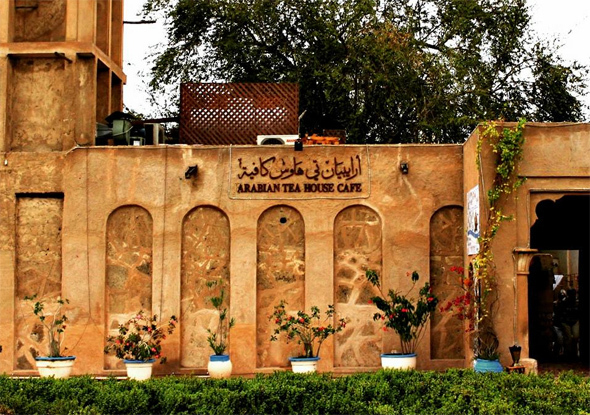 Arabian Tea House, Al Fahidi Historical Neighbourhood, daily 7.30am to 10pm. More info on website. After lunch you’re going to wander through the atmospheric Textile Souk. Be prepared to have your appearance compared to Shakira or Brad Pitt, but unless you really want that pashmina, simply smile and keep walking. 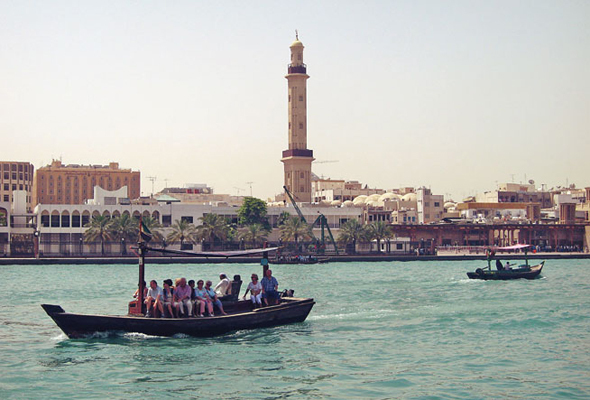 You’ll soon reach the abra station, where you’ll hand over a one dirham coin and enjoy the best cruise in the city. Enjoy the feeling of the warm breeze in your hair and watch the gulls circle above as you chug your way across Dubai Creek. Bur Dubai Abra Station to Deira Old Souk Abra Station, daily 6am to midnight, boats run every few minutes. More info on website. Hop off the abra and either make your way through the Gold Souk to Al Ras metro station, or catch another taxi and make your way to the shopping behemoth that is The Dubai Mall. Now, you could easily spend your entire 12-hour day here (and many people do) but there are a few main sights you’ll want to tick off. First, observe the marine life at Dubai Aquarium – one of the largest suspended aquariums in the world. Then make your way to The Souk Dome, where you’ll meet the mall’s 155-million-year-old resident dinosaur, Dubai Dino. Exit the mall and you’ll find yourself at the foot of the world’s tallest building, the Burj Khalifa. Take a selfie and ignore your multiple chins as you attempt to fit it all into shot. 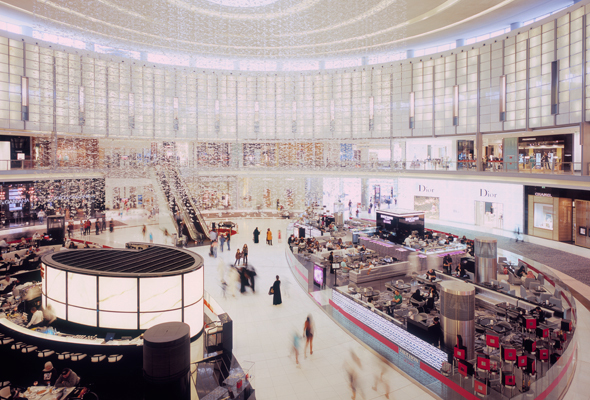 The Dubai Mall, Downtown Dubai, daily 10am to midnight. More info on website. Escape the mall and take a taxi to the Madinat Jumeirah, a picturesque labyrinth of five-star hotels, shops and restaurants. If you still haven’t done your souvenir shopping, you can pick up a stuffed camel or two here. Or if you want a classic “Dubai” experience, head to the Talise Spa. We recommend trying a hammam – a traditional bathing ritual in which every inch of your body is scrubbed down. You’ll feel squeaky clean and refreshed for your onwards flight. 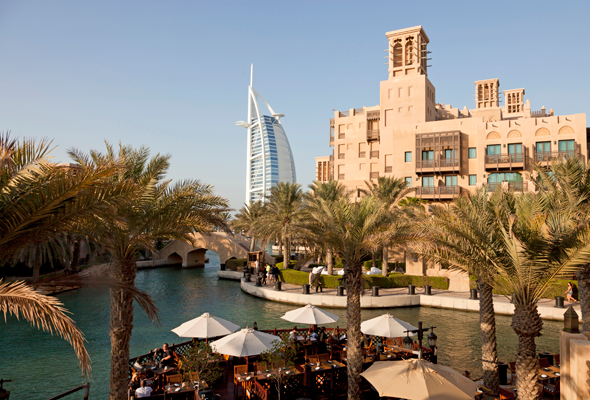 Madinat Jumeirah, shops open daily 10am to 11pm, restaurants open daily 8am to 2am. More info on website. This one is so good we almost want to keep it to ourselves, but that wouldn’t be very hospitable now, would it? Folly by Nick & Scott is a restaurant in the Madinat Jumeirah that has one of our favourite happy hours in the whole city. 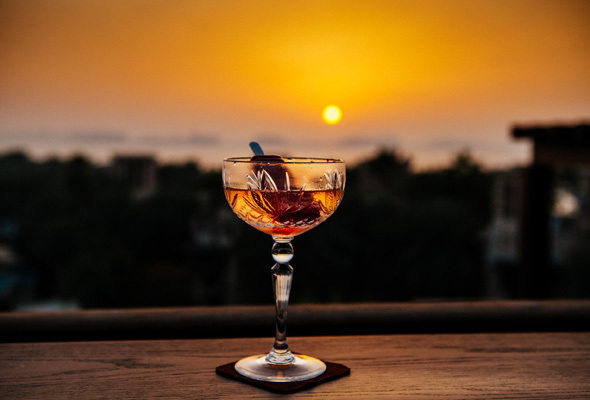 Head up to the rooftop between 3pm and 7pm, and not only will you enjoy spectacular views of the winding Madinat Waterways, but you can also order a discounted tipple from the special “Sundowners” menu. Try the Prosecco Pop – a fruity ice lolly served in a glass of bubbly. folly by Nick and Scott, Madinat Jumeirah, daily 3pm to 7pm. Tel: (04) 430 8535. More info on website. It’s almost time to leave Dubai, but not before having dinner at one of the city’s most infamous restaurants. Located in the working class Satwa neighbourhood, Ravi’s serves up almost worryingly affordable Pakistani food. It doesn’t look like much from the outside, but it counts Snoop Dogg and Craig David among its fans. Tuck into heaped plates of biryani, curry, and grill, and you’ll still manage to walk away with change from Dhs100. 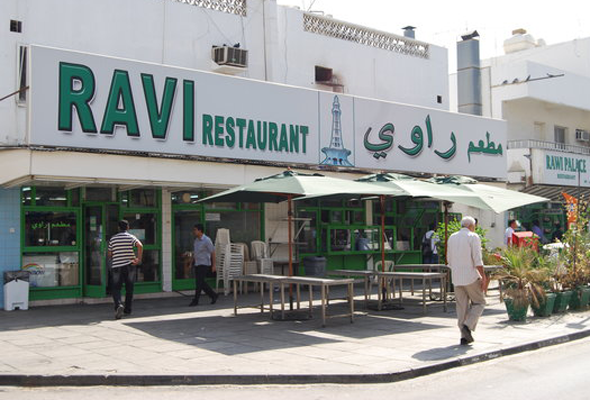 Ravi Restaurant, Al Dhiyafa Road, Satwa, daily 5am to 3am.